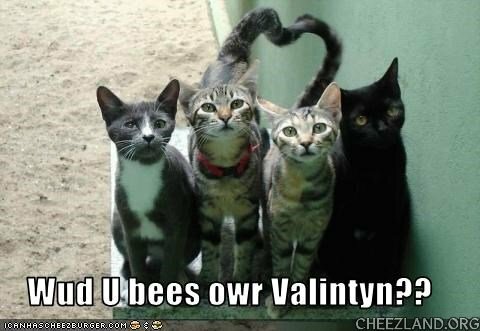 Wud U bees owr Valintyn?? congrt to anni and ocm onna Valentine tie! I’ll be the midnite kitteh’s ballentine, pls. Wat AWL of u? Of cors! Ohai OCM! We hab a tye. Um.. wud u liek sum rayn? We hab a sir plus. Oar snow? Der’s plentee tu share! In return Ai will sending u sum sunny shine. We can has a lot of it. doo napplols maek yoo sleepy affer yoo eets dem? Adn wile yore at it, cuud yoo get sum gloo remoover? Ower taylols seem tu be stukk togevver. Kthnx. Onlee iv yu wants snorglols adn cuddlols adn smooshuz. Awww…haow cud ai sai noe tew doze lil faises? Yoo doin a gud job followin along. In Cheezland, the time is 04:52.